Interests:Pursuit of God, His majesty, His greatness--with all of my heart, soul and might. 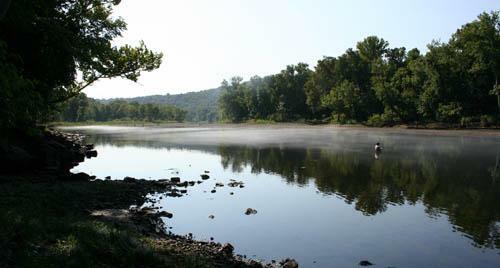 Lake Taneycomo is a tailwater fishery. 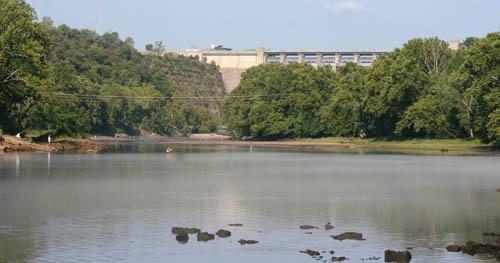 When Table Rock Dam is not generating, the water below the dam is stable and easy to read. 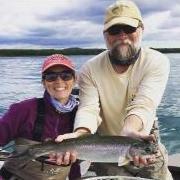 I will, in this article, describe each area and how to fish for trout with a fly rod. I going to assume you are wading. The water below the dam isn’t very deep. In most areas, the water won’t be over your waders. There aren’t any holes or drop offs except directly around the boulders placed my the Missouri Department of Conservation for fish habitat. The deepest water is up close to the cable, marking the boundary line in which not to fish above. This water is too deep to wade so be careful. Most of the bottom of the lake is gravel but there is larger chunk rock as well as bed rock. There’s steady, slow current current from the cable down to the Rebar Chute. Rebar is where the lake switches sides, moving quickly down about a 150 foot long, 40 foot wide chute. This actually changes slightly through the years from heavy water flows from generation and flood gates. The lake opens up below Rebar to a big pool we call Big Hole. What used to be a deep hole has filled in with gravel over the years but is still 3-4 feet deep. The water, again, moves slowly through, then almost stops before hitting the Rocking Chair area. The Rocking Chair is marked by an access from the south side of the lake, where a person could walk down from a parking area to the lake and sit a rocking chair on the level bank there, sit and watch the lake. I’m sure it’s been done. You’ll find more chunk and bed rock here, shallowing up a bit so the water picks up speed. Just before you get to the MDC boat ramp access (north side of the lake), the lake gets deeper and narrower, hugging the north bank. Some of the bottom is gravel as well as clay with a big gravel bar on the south side. At the bottom of this stretch, the lake again changes sides creating a long chute with gravel bottom. This chute is much longer and wider than Rebar, emptying into a stretch called Trophy Run. Trophy Run is a development on the south side of the lake marked by a community building. The lake is very deep here, more than 10 feet in spots, and is not wadeable. At the bottom of this run is Lookout Island. At Lookout, and lake becomes shallow again but wide. There’s some current here but I wouldn’t call it a chute at all. At the island, the water starts to deepen, dumping into Lookout Hole. The bottom is all gravel through the shallow areas but turns into bed rock below the island. This ends the areas I want to cover in this article, although there is good wading and fly fishing below Lookout. Film Flies: Soft hackles and Cracklebacks. Also in this category, I have to add RS2’s, WD40’s, Parachute Midge — any fly they settles just below the surface. Soft hackle color and styles: Bodies can be thread with wire wrap, red, black, green, yellow, orange. Wire wrap only with copper, gold or silver. Flash or another type of mylar material, pearl, pearl red or pearl green. Sizes range from #14 to #20, #20 being the extreme. I usually stay with #16’s and #18’s. Cracklebacks are tied with furnace hackle with various colors bodies. Peacock herl is the preferred material in natural green, yellow, orange and red. Size is usually a #14. Dries: Blue Olive Dun, black ant, Adams, Humpy, Elk Hair Caddis, Royal Wolfe, various midges, Griffin’s Gnat, Stimulator and beetles. Sizes vary depending on the fly but normal sizes, mid range — #14’s and #16’s, would work most of the time. Wet Flies: Scuds, Prince Nymph, Pheasant Tail, Squirrel Tail, sow bugs, various emerger patterns, San Juan Worm, White Mega Worm, eggs patterns and small bead heads. Sizes vary from #14’s to #22’s. 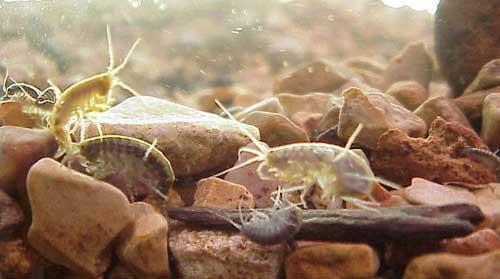 Scuds, or freshwater shrimp, are tied with many types of dubbing material — rabbit, squirrel, mink, possum, kangaroo, dog or cat, synthetics like rayon, and combinations of all of the above. They’re tied on either a TMC #2487, #2457, #3769, #3761 or a #200R hook, depending on your preference. They can be wrapped with wire, weighted or tied with a shell back. Scuds in the natural can be varied shades of gray, olive, tan or brown. When they die they turn orange. They can be fished in sizes ranging from #10 to #20 but the average size is #14 to #18. I use weighted scuds and sow bugs. You can also use non weighted bugs and add split shot but I find that a split shot will gather moss and catch on rocks more than the fly will. 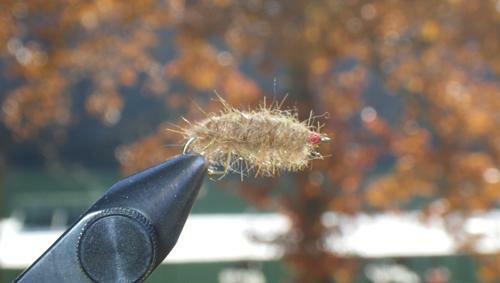 Streamers: Woolies, Wooly Buggers, Sculpins, Pine Squirrel, PMS, Hibernator, Mo Hair Leach. Woolies and Buggers run from #10’s to #16’s in white, olive, purple, black, brown and pink. Sculpins usually are fished in size #8 or #10. Good colors are gray, ginger, olive, orange, brown or white. Pine Squirrel, PMS, Hibernators and Leeches are fished in the same sizes, adding black, blood red, purple and white to the color selection. Outlet #1 is a small stream that flows out a pipe, down a chute, then across a gravel bar in to the lake. The stream is very small and really doesn’t hold fish itself. There’s a dropoff at the end where it meets the lake. Trout will hold on this drop and will take a variety of flies. The lake from the cable down about 150 yards is wide and very little current. This water is good for stripping flies and dead drifting nymphs and midges. This is one of the best places to strip sculpins along the bottom. As the lake narrows and gets a little shallower, the current picks up. The trout can be more active in this area, picking up midge larva as well as scuds and sow bugs. Fish are apt to take surface and/or film flies like small dries, midges, soft hackles and cracklebacks. Outlet #2 enters the lake as a waterfall and doesn’t run very far before hitting the lake. Trout are attracted to this outlet more than any other because of the volume of water and the frequent run of trout food escaping from the hatchery raceways. Fish take many kinds of flies here, mainly dead drifting. The number one fly is a scud with egg flies and San Juan worms close behind. Because the water is faster here, you can get away with using a little heavier tippet. The pool below outlet #2 is good for stripping small streamers, film flies and dead drifting midges. Also strip sculpins along the bottom here. Where the lake picks up speed again close to the Rebar Chute, you’re back to drifting scuds, midges, eggs and worms. In the chute, all of the above with more weight of course. The short stretch below the chute has changed. It’s not as deep as it used to be but it’s still a very area for fishing a small dry or small midges. Swinging and stripping flies in the Big Hole, especially when there’s a chop on the water, can be excellent fishing. Also dead drifting midges under an indicator. This big area is where you can start fishing a jig under a float–micro and small marabou jigs under a float in various earth colors. At Rocking Chair, drift scuds, sow bugs, worms and egg flies in the slow current. Strip film flies if there’s a chop on the water. Throw small dries if the trout are rising to midges. Back too a jig and float at the boat ramp since the water is much deeper. Also beaded flies under a float at various depths. Using sink tip line, throw sculpins in this deeper water because there’s a very good population of sculpins here. The big chute is a great place to dead drift all kinds of flies close to the bottom and for stripping and swinging streamers and film flies. Work the end of the chute, where it opens out and slows, with those streamers and film flies. You’re jig and float will work very well through the long, deep water at Trophy Run. Pay attention to the depth of the jig because the water here can be as deep as 10 feet. Find where the trout are — start at 4 feet deep and work down. When the water starts to shallow up, go back to dead drifting nymphs and midges. As the current picks up, swing and strip film flies. Then, after the water gets deeper, fish all of the above — jigs, scuds, midges, eggs and worms. Also strip sculpins in this area. In the areas that I would use something under an indicator like a jig or midge, deeper water like from the cable down below outlet #1, Big Hole, MDC boat ramp or Trophy Run, a double fly rig is useful, pairing a heavier fly with a small fly, the heavier fly (jig) being on top and the smaller fly (zebra midge, scud or even soft hackle) on the bottom. We use this rig down lake in deeper water with a fly or spinning rod. Tippet recommendation: 5x – 7x. Use a dry fly as an indicator. There are times our trout will readily take a dry even though there’s no hatches occurring. Use a big enough dry to float your nymphs or midges. Keep your leader greased well so that your line doesn’t drag your dry underwater. Any of the dry flies I mentioned are good to use. Tippet recommendation: 5x – 6x. In areas where there’s fairly good current, and you’re dead drifting a nymph under an indicator, add a soft hackle below the nymph. At the end of the drift, let the flies swing up. This is good action for the soft hackle and chances are you’ll get bit at the very end of the drift. Tippet recommendation: 5x – 6x. Sight Fishing – Even with the water off, no generation, water level on tailwaters is constantly changing, most times by only inches. Fish are keenly aware of this and will work the edges of the water for bugs moving in and out with the water. When bugs (scuds, sow bugs) are on the move they are easy to pick off. Therefore, the edges of the shore is the best place to sight fish. When targeting these fish, use something they’re looking for — scuds, sow bugs, midges and worms. Don’t back down from using large imitations, especially where there’s schools of trout working a bank. Competition spawns aggressiveness and aggressiveness promotes eating flies that don’t look anything like natural food. Tippet recommendation: 5x – 6x. Case in point: The White Mega Worm. This big, fluffy yarn worm, sometimes tied on a very small jig head, is more than an attractor fly. Big trout are known to attack this fly in very shallow water. It also works in deeper water. If the fly disappears, it’s probably in a fish’s mouth — set the hook! I suggest using 4 or even 3x tippet. You’ll find yourself getting excited seeing the fish take the fly and setting the hook too hard can be a problem. Plus using a big fly like this, you can get away with heavier tippet. Midge flies are a fly fisherman’s staple on most tailwaters. Taneycomo is no different. We have midge hatches every day, sometimes all day and even at night. Without going into details like a midge’s life cycle, I just want to convey what midges to use in certain conditions. I’ve caught more trout using a simple rig where I use a zebra midge under a palsa float than any other technique. Depth is important. 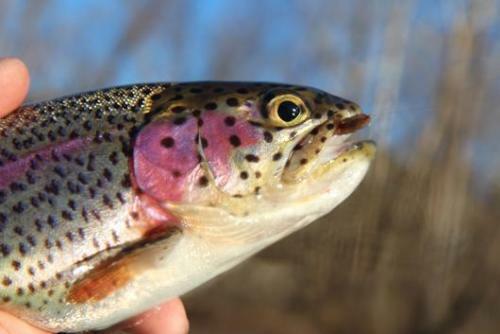 If trout are actively taking flies off the surface or in the film, set the indicator only 6 to 12-inches from the first fly. If there’s little or no activity, set it deeper and keep adjusting until you start getting bit. Tippet recommendation: 6x – 7x. Soft hackles and Cracklebacks are what I call film flies. Both can be skimmed across the surface or just under the surface in the film. Use long leaders and make long casts. There are many ways to retrieve this fly from short, fast to long, slow strips. If there’s current, letting the fly just drift and swing will draw a strike. Tippet recommendation: 5x – 6x. 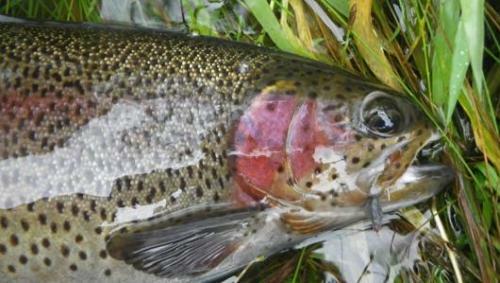 Streamers are worked in and same way except the fly is further under the surface. Sculpins are fished with heavy tippet. Most sculpin flies are weighted enough you shouldn’t need to use sink tip leaders. This fly is worked across the bottom so you should use it in gravel areas mainly. Sculpin move quickly from spot to spot, coming to a complete stop when they’re not moving. Your retrieve should mimic this action. Tippet recommendation: 2x – 3x. Keep in mind trout in shallow water spook easily so stay on dry ground when ever possible. Rainbows will cruise the edges of the shore in very shallow water looking for scuds which travel along the banks. Don’t just arbitrarily wade out to the middle of the lake — you’ll miss some of your best fishing opportunities. Try to land your fly line as gently on the water as possible when casting. 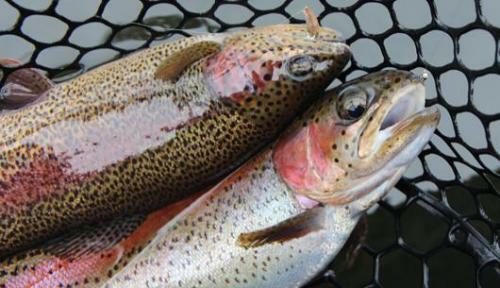 It is true our rainbows are used to anglers casting and wading in the upper lake but you’re chances improve greatly the more stealth you are in your presence. Proper mending of line is a must when dead drifting, swinging and even stripping flies. Pay attention closely and make adjustments where needed. Change. I suggest never casting and retrieving the same way more than a few times. Cover water like you’re painting a wall. Vary your strip patterns till you find what the fish like and then if they get off that pattern, change again. Same with flies. Change color and sizes will you find something that will work. Never assume they’re not feeding — they’re just not interested in what you’re throwing and/or how you’re offering it. Your indicator should be as small as possible to float and/or pull the fly through the water you’re fishing. If you’re dragging a fly across the bottom, like a scud, your indicator needs to big a little bigger so that the fly, when it catches the bottom, doesn’t stop, pulling the indicator under. This especially works in #2 outlet and the Rebar Chute. Dead drifting: Always set the hook downstream, into the fish’s mouth. Keep the rod tip low when possible and use the water to add tension to the line set. It will be a quicker hookset as well as keep your lone/fly from ending up in the trees behind you. Film flies: Soft hackles and cracklebacks. On the take, trout will almost always hook themselves. Setting the hook will break your line more times than naught. Fish will almost always feed better under a choppy surface verses a calm, slight surface. Current does make up for no wind but still, a slight breeze does wonders for the bite. Couple of things to consider when reading the water. Darker skies and broken water — fly size can be bigger and so can your tippet size. Bright sunshine and slick surface conditions mean the fish won’t be as active and can see everything more clearer. Drop in tippet size and go to smaller flies. Phil that should help anyone catch fish,great job. I agree, very well put together. Thank you, that was an excellent piece. It's an old piece... but I'll update it here soon.